Lute's odyssey makes for an intriguing balance of action and reflection." In 1991 Dr. Lute Jonson, one of two co-directors of the Dead Sea Scrolls International Study Team in Jerusalem, decides to reveal explosive news contained in 2000-year-old fragments he and his friend and co-director Father Sean O'Derry have kept secret for 40 years. The seven fragments contain carbon-dated evidence of where the teenaged Jesus of Nazareth lived, and who He loved. Fr. O'Derry vehemently objects to their release, arguing that the faith of a billion Christians could be destroyed if this "spiritual virus" were released. Lute steals the originals and escapes to America to make the announcement. 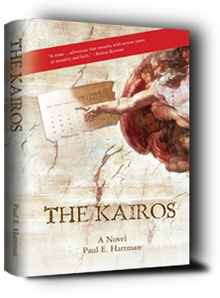 A deadly global chase ensues, leaving a wake of astounding revelations about a new kairos, a new "breakthrough by God into human time." The Kairos is a suspense novel with a sexual subject that's timely and a human-spirit theme that's timeless. NY Times Best-Selling Author Sheldon Siegel writes, "The Kairos' intriguing, highly controversial premise takes readers on a fast-paced ride in a deftly-executed thriller. We'll be hearing more from this talented new author. Highly recommended." "A wild ride, ancient evidence of a shocking truth, and wickedly good plot twists lead to surprising revelations. The time has come for The Kairos." ~Author/Blogger/MCC minister Kittredge Cherry. adventure that wrestles with serious issues of morality and faith."